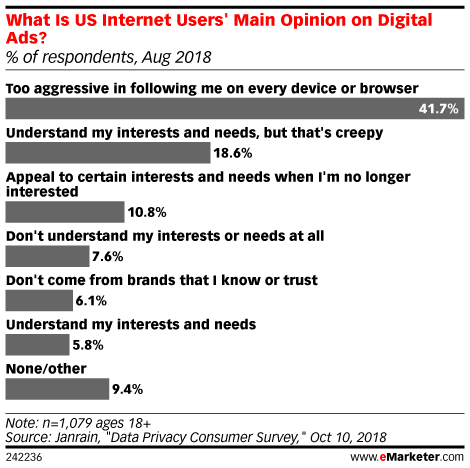 Data is from the October 2018 Janrain "Consumer Attitudes Toward Data Privacy Survey." 1,079 US internet users ages 18+ were surveyed online during August 2018. Respondents identified their gender as female (54.6%) or male (45.4%), ages 18-29 (26.9%), 30-44 (21.8%), 45-60 (24.5%) or 60+ (26.8%) with a household income of $0-$9,999 (6.4%), $10,000-$24,999 (11.3%), $25,000-$49,999 (18.8%), $50,000-$74,999 (17.4%), $75,000-$99,999 (13.6%), $100,000-$124,999 (9.4%), $125,000-$149,999 (3.7%), $150,000-$174,999 (3.7%), $175,000-$199,999 (1.5%) or $200,000+ (2.8%). Janrain is a customer identity and access management company.